"I've never seen a body mutilated like that." Danish director Lars von Trier began filmmaking as a boy using his mother's 8mm camera. At age 12 he starred in the Danish television series Clandestine Summer. When he entered the Danish Film School (where he adopted the "von") for practical training, he immediately found conflict in the style of work and rules of direction he was being taught. His first feature Element Of Crime contains just about every one of the forbidden tools of filmmaking—voice over, location titles and use of flashbacks. The first of a trilogy co-written by long time collaborator Niels Vørsel, and set in a decayed Europe, The Element Of Crime and its successors Epidemic and Europa (aka Zentropa) utilize stylings that disorient the viewer, as the narrative is not always precise. We are drawn in by the complexity of a story being told by one who is not fully conscious of its outcome, as scenes play out with the emotion of the moment, as in memory, rather than distinctly and clearly detailed, with powerful images cutting into the storytelling as they would in dreams. With its use of rain drenched sets and tone of imminent foreboding, The Element Of Crime nods to the stylings of Dreyer, Tarkovsky and Hitchcock, and is soaked in noir feel and German expressionism. It is an unsettling atmosphere, a suitable location for a journey into the mind of a madman. As the film opens, a therapist (Ahmed El Shenawi) is in the process of hypnotizing police detective Fisher (Michael Elphick), in an effort to recall the events which preceded his return to Egypt. The recollection begins with Fisher's return to an unspecified part of Europe, presumably Germany, which has suffered a catastrophe, lying in perpetual darkness and with water everywhere. He had been exiled to Egypt for thirteen years, but is recalled by an old colleague, now Police Chief Kramer (Jerold Wells) to investigate a series of gruesome child murders. His first stop is the house of his former mentor, Osborne (Esmond Knight), who had written The Element Of Crime, a book on a method of tracking the criminal by assuming their mindset. Now an old man, Osborne has rid himself of his extensive book collection, and dismisses his earlier work as folly. Fisher, however, is certain the methodology has merit, and as he begins to unearth clues that the murderer may be Harry Grey, a subject Osborne had tailed years earlier when he was an active police officer, he decides he must delve into the criminal mind and follow the paths taken by the suspect in order to finally capture him. Returning to the scene of one of the previous murders, he visits the nearby brothel and meets up with a young prostitute, Kim (Meme Lai), who becomes his accomplice for the search. As the trail continues, Fisher immerses himself in his quarry's state of mind, continuing in the footsteps that went before him. As each clue leads him deeper into the psychology of the murderer, he begins to realize what The Element Of Crime is all about. Probably best known by western audiences for his later works, such as the television mini-series Riget, or his 1986 feature Breaking The Waves, von Trier's The Element Of Crime nonetheless made a significant impact upon its release, and was nominated for a Golden Palm and won the Technical Grand Prize at Cannes in 1984. The film is very dark and shot in shades of sepia tones, broken only by brief glimpses of other colors in television screens or in casts on buildings, which, in and of itself is alienating. The camera is in almost constant movement, roving through the desolate landscape and assuming intriguing perspectives on each scene. Often, the subjects are abstract, thankfully so, as when the viewer finally realises what they are seeing, the horror of the visual is allowed to set in. There are many disturbing sequences in this film, particularly if you are sensitive to sexual deviation or empathetic with animals. The bleakness of the locations can not be understated, von Trier's world is in a state of decay, and we are witness to all the stench brought by this evolution. Subjects are brought in and out of camera with a claustrophobic feel, we are almost always too close to the scene. This is anything but a pretty picture, the images and subject matter are haunting. In this lies its brilliance. There are moments of perverse humor involved, Fisher's experience with beverages, the use of a Volkswagon for unintended diversions, and a cameo by the director as a skinhead hotel clerk. But the tone of the film is driven by an incestuous evil that saturates the landscape and leads the characters towards their ultimate ends. Image Transfer Review: The style of this film is wonderfully captured in a new 16:9 enhanced transfer. The sickly sepia tone casts to the film is preserved against deep blacks, and the very fine film grain is captured well. There are no compression anomalies or other defects to detract from the picture. The Tranceformer documentary is featured in non-anamorphic widescreen (1.66:1) and is primarily in Danish with English subtitles. Audio Transfer Review: Audio is clean and clear with no noticeable degradation. Dialogue is very intelligible except on a few occasions, and Bo Holten's score is well preserved. Tranceformer documentary on Lars von Trier by Stig Björkman. 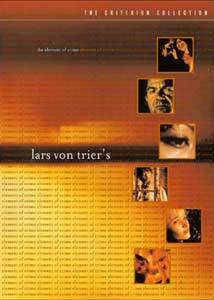 Extras Review: Accompanying the feature is Tranceformer, a 53-minute documentary by Stig Björkman on Lars von Trier. Covering his professional career and interspersed with von Trier's home movies and student films, the documentary gives a very nice introduction to the world of the director. Interview clips with von Trier and his friends and collaborators are featured, including cinematographer Tom Illing, editor Tomas Gíslason, and writer Niels Vørsel who speak candidly about his process, his philosophies and his phobias. Extracts from his films The Element Of Crime, Epidemic, Europa, The Kingdom and student film Orchidégarneren are included along with behind the scenes footage on the sets of Breaking The Waves, with appearances by stars Katrin Cartlidge and Stellan Skarsgård with additional interview footage of Ernst-Hugo Järegård, star of Europa. As a worthy extra, this rates very highly, adding great depth to the viewer's knowledge of the director of the feature film. The theatrical trailer is also included along with Criterion's standard color bars. The insert features an essay on von Trier and The Element Of Crime along with chapter listings and film credits. English subtitles are also available. Heavily stylized, this is a fascinating and haunting first film. I wouldn't recommend this for everyone due to several scenes which may disturb more sensitive viewers. The supplemental documentary is insightful and very interesting. Those looking for a dark, inventive thriller would do well with The Element Of Crime.